From 8 to 15 December 2018 the Amsterdam Rainbow Dress Foundation was in South Africa. 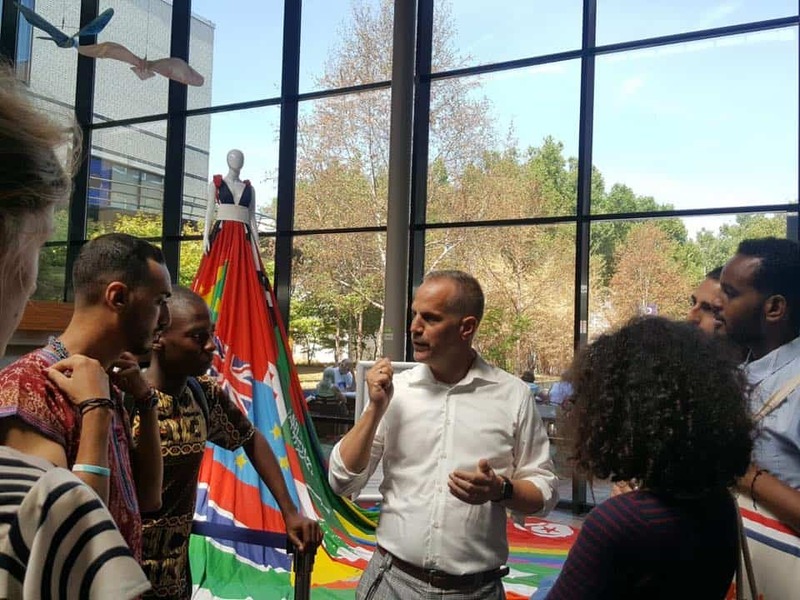 At the invitation of the Dutch embassy in Pretoria we presented the Amsterdam Rainbow Dress at Constitution Hill in Johannesburg during the international human rights day on December 10. We were part of a discussion program on LGBTI + rights at the Dutch Embassy in Pretoria. Finally we presented the Dress in Cape Town in the MOCAA museum. Here too we participated in a substantive program on LGBTI + rights. Of course we also expanded our Art Photography series with a first photo on the African continent. 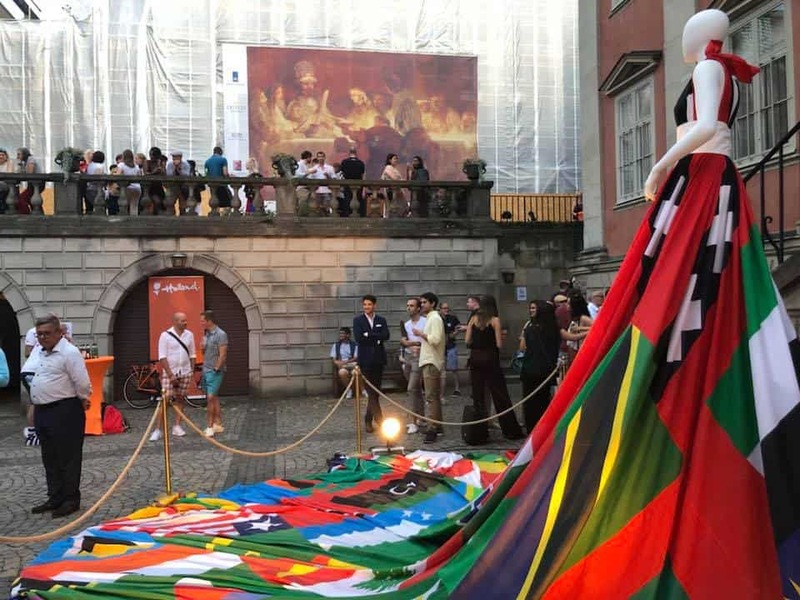 On the 2nd of August the Amsterdam Rainbow Dress was presented during Europride 2018 in Stockholm as part of the program of the Embassy of the Kingdom of the Netherlands. Presenting during Europride was special because in 2016 the Amsterdam Rainbow Dress was created during Europride in Amsterdam. During the Amsterdam Pride the Rainbow Dress was on display in City Hospital OLVG in Amsterdam. After traveling around it was good to have the Dress on display in her hometown. 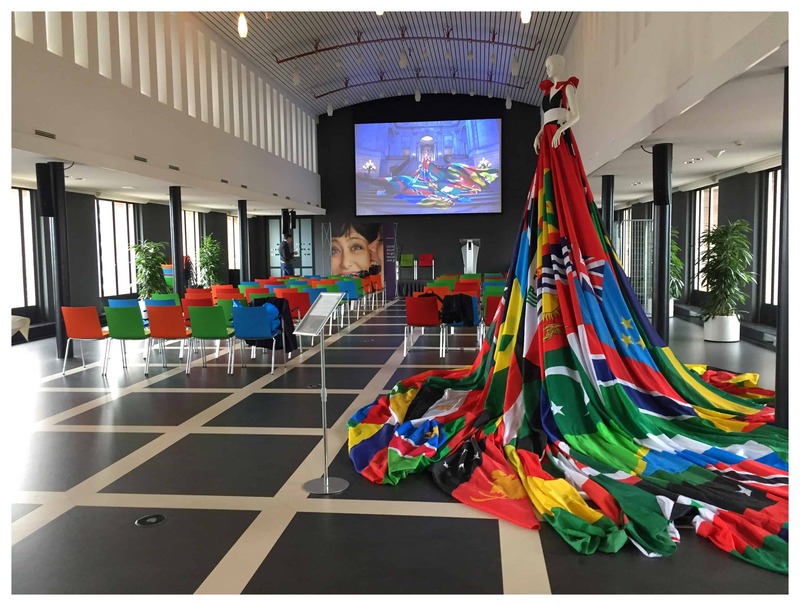 During the week in the OLVG a group of international LGBTI activists was welcomed to see the dress and hear the story behind it. 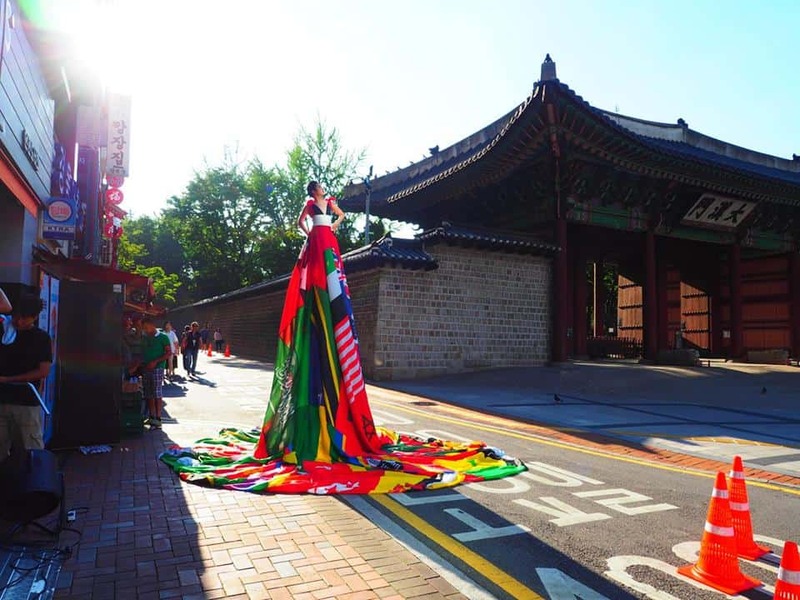 From July 12 – 16 the Amsterdam Rainbow Dress Foundation was present at the Seoul Queer Culture Festival. The organization of the SQCF joined forces with The Embassy of the Kingdom of the Netherlands in South Korea to make it possible for us to tell our story and meet the LGBTI+ community in Korea. Of course we made a new addition to our series of art photography. This was our first visit and the first photo on the Asian continent. From 4-8 July the Amsterdam Rainbow Dress was in Madrid for the Pride. On invitation of the Embassy of the Kingdom of the Netherlands we presented the Amsterdam Rainbow Dress during the Pride on several different locations. Besides that we did two photoshoots. One in the Prado Museum and another one durin the Pride Parade. 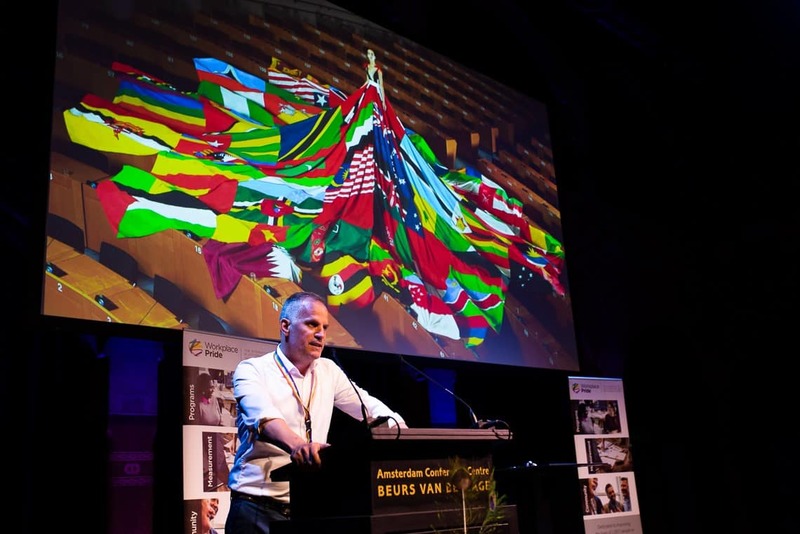 On 18 May 2018 the Amsterdam Rainbow Dress was presented during the international conference of Workplace Pride in Amsterdam, Beurs van Berlage. 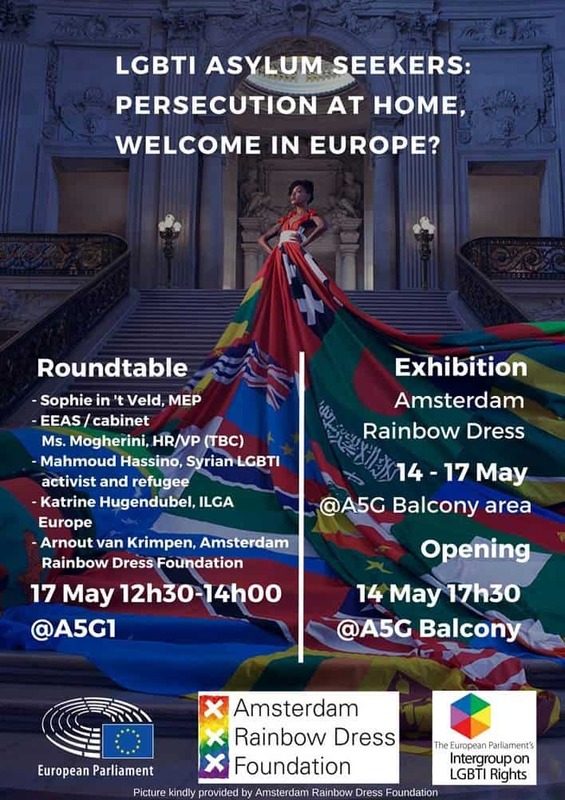 From 14-17 may 2018 the Amsterdam Rainbow Dress was be on display in the European Parliament. On the 17th of May (IDAHOT) the Amsterdam Rainbow Dress Foundation presented the Amsterdam Rainbow Dress in the Parliament and took part in a roundtable discussion organized by the Intergroup LGBTI of the European Parliament. 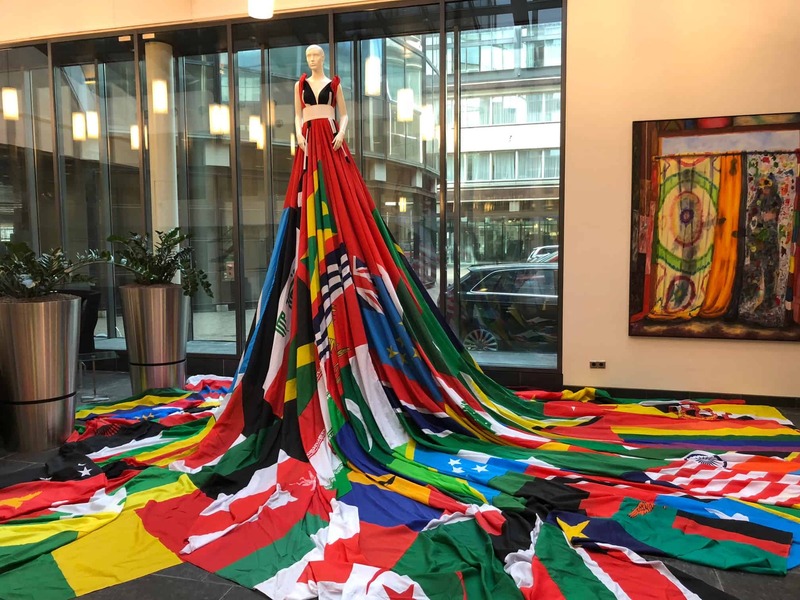 In February 2018 the Amsterdam Rainbow Dress was exhibited in the hall of the Dutch Central Bank. An exhibition with an LGBT theme was compiled from the art depot of the bank. The Amsterdam Rainbow Dress was added to this exhibition as artwork from ‘outside’. The Dutch Central Bank made a generous financial donation to the Amsterdam Rainbow Dress Foundation. 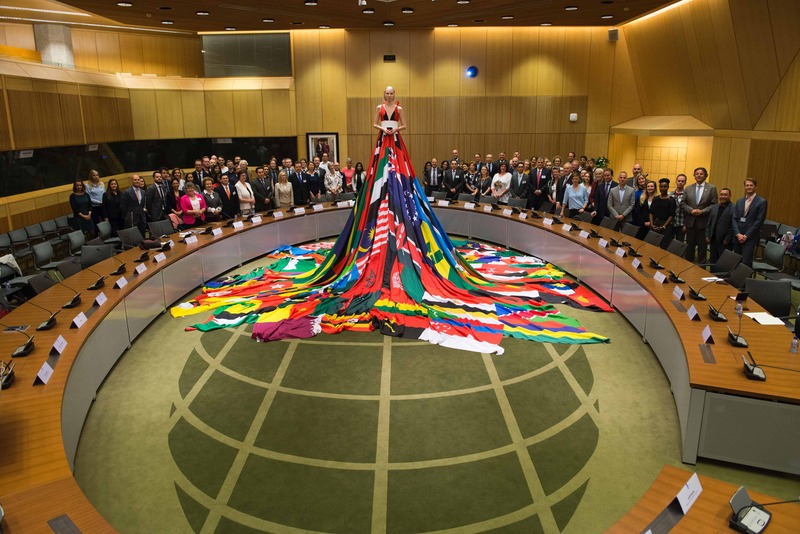 During the coming out day 2017, the Amsterdam Rainbow Dress was presented at the Ministry of Economic Affairs in The Hague / the Netherlands. The Amsterdam Rainbow Dress was exhibited for a number of days and the Foundation participated in an afternoon program that focused on diversity. On Wednesday, August 2 2017 the Amsterdam Rainbow Dress was donated to the Amsterdam Museum. The dress is therefore part of the history of the city of Amsterdam. The Amsterdam Rainbow Dress Foundation will continue to travel with the dress, raising awareness on state-sponsored homophobia worldwide. The object has now however been granted a status of museum piece and is therefore strengthened in it’s cause. Press release on the donation of the Amsterdam Rainbow Dress to the Amsterdam Museum (Dutch | PDF- file). In May 2017, the foundation traveled to San Francisco as part of an LGBTI+ focused mission with Amsterdam deputy mayor Kukenheim, with the support of the cities of Amsterdam and San Francisco and the Dutch General Consulate in San Francisco. 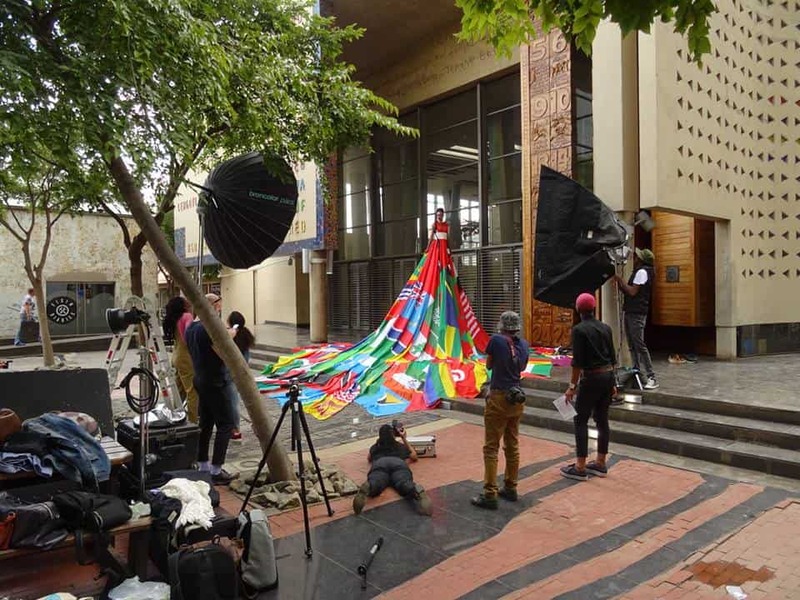 The foundation was enabled to produce a set of strong images showcasing the Amsterdam Rainbow Dress: a token of strength, resilience and support for the LGBT+ community and those who are displaced because of anti-LGBT+ legislation worldwide. The Amsterdam Rainbow Dress Foundation is sincerely grateful to have been enabled to continue the worldwide campaign for awareness on anti-gay legislation and those affected by oppression, violence and prosecution because of who they are or whom they love. Report on the LGBTI+ mission from Amsterdam to San Francisco by deputy mayor Simone Kukenheim (Dutch | Municipality of Amsterdam website). 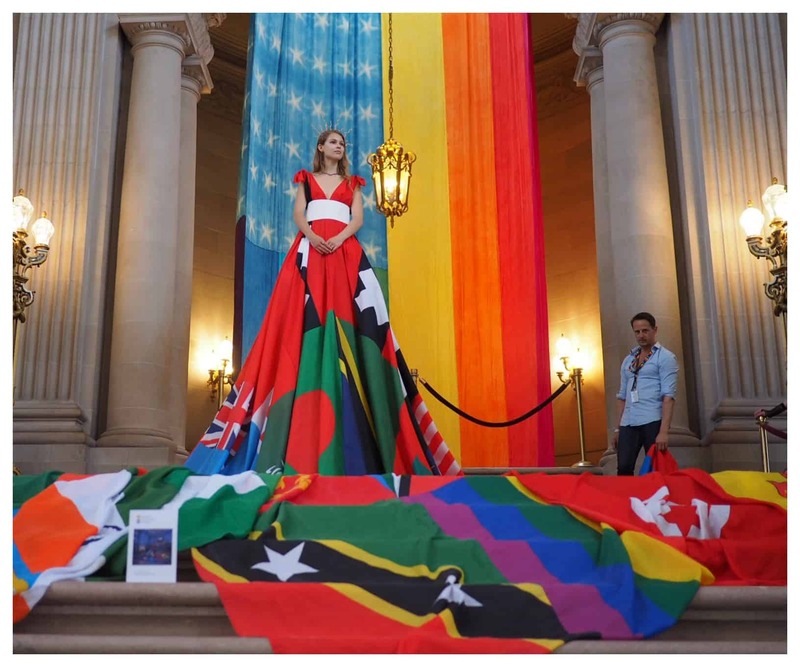 Article on the presentation of the Amsterdam Rainbow Dress at San Francisco City Hall (Dutch | Municipality of Amsterdam website). Announcement of the Amsterdam Rainbow Dress joining the LGBTI+ mission from Amsterdam to San Francisco by deputy mayor Simone Kukenheim (Dutch | Municipality of Amsterdam website). On May 17 2017 we celebrated IDAHOT with the Amsterdam Rainbow Dress being presented to the Equal Rights Coalition at the Dutch ministry of foreign affairs in The Hague, the Netherlands. IDAHOT, The International Day Against Homophobia, Biphobia and Transphobia, is about looking back and looking forward. 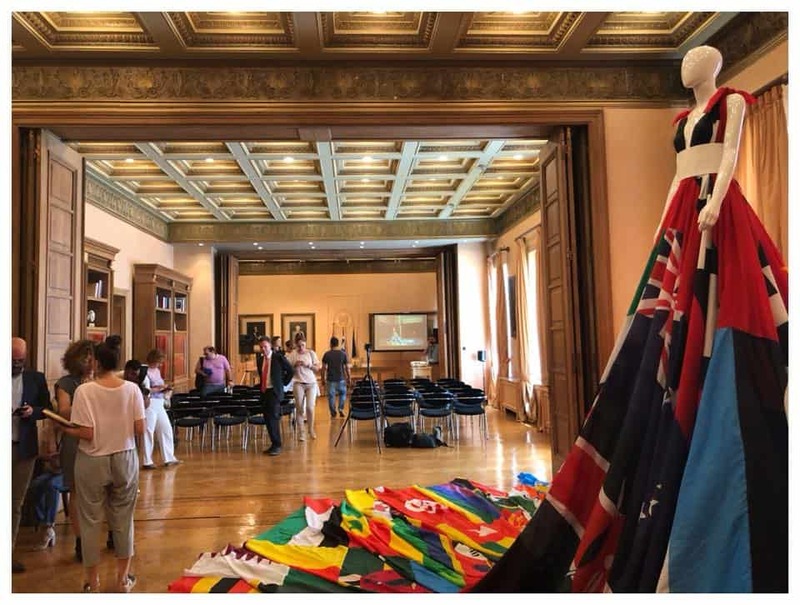 We are very proud to have presented the Amsterdam Rainbow Dress at the ministry of Foreign Affairs, in presence of their excellencies minister Koenders and the ambassadors of the countries that are part of the Equal Rights Coalition. IDAHOT is the day we commemorate the declassification of homosexuality as a mental disorder by the WHO, which happened on May 17, 1990. 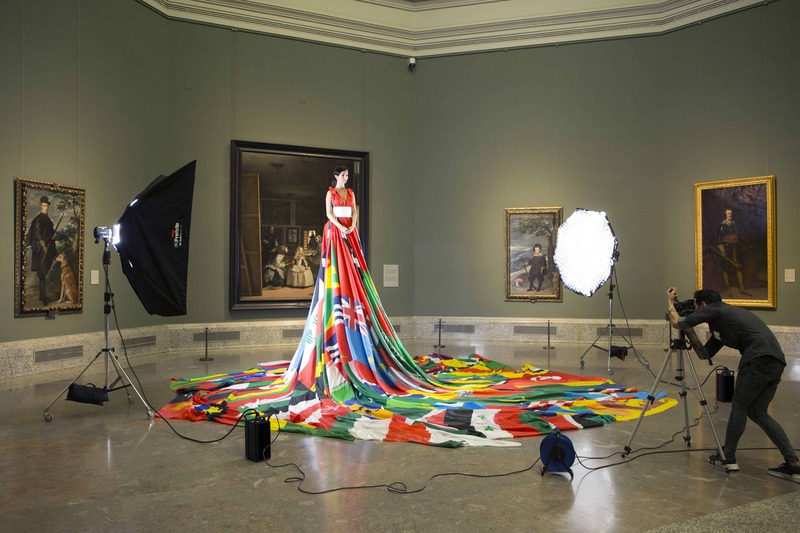 With 75 countries incorporated in the Amsterdam Rainbow Dress, there is still a lot to be achieved around the globe. Amsterdam Rainbow Dress presented at the Dutch ministry of Foreign Affairs (EN | Website of the Dutch government). Speech of Dutch foreign minister Koenders during IDAHOT 2017 (EN | Website of the Dutch government). Article on human rights report (Dutch | Website of the Dutch government). The New Institute, Museum for Architecture, Design and Digital Culture located at the Museumpark in Rotterdam, Showcased the Amsterdam Rainbow Dress during Rotterdam Pride. Article about the presentation (Dutch). An up-to-date list of all flags currently incorporated in the Amsterdam Rainbow Dress*.